10 minutes away from a Santa Monica fundraising lunch attended by President Obama, a gunman killed four and wounded three (one in critical condition) with a semiautomatic rifle before being shot and killed by police at the Santa Monica College Library yesterday. The police were initially summoned to a burning house with two male bodies inside — at first, cops weren't sure if their deaths are related to the shooting, but very early this morning determined it was the deceased suspect's brother and father, according to Buzzfeed (which also features Vines and live-tweets of the scene). 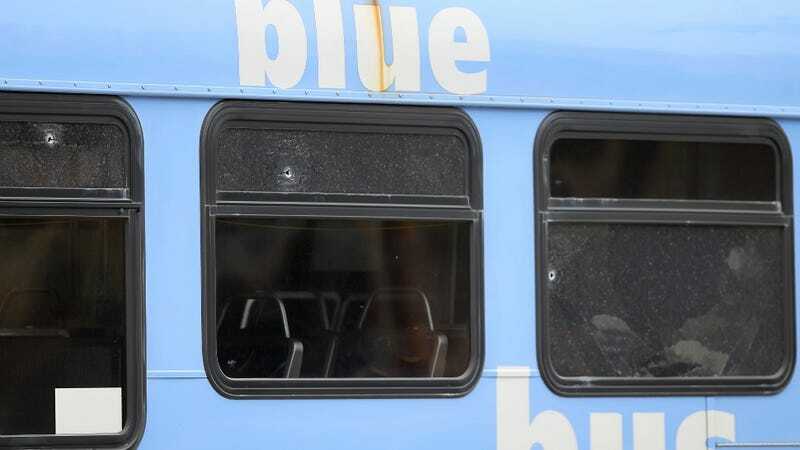 From there, he hijacked a woman in her car and forced her to drive him across town, stopping at intersections to shoot indiscriminately at buildings, a bus, various cars and police vehicles until being gunned down about 20 yards from the campus library. He was also armed with various other weapons. The entire route took about 10 minutes. A second "person of interest" in the shooting was detained and questioned, and later released. Police are not calling this a college/school shooting and are still trying to determine a possible motive. [Update] CNN reports that the gunman had previously been sent to a psychiatric facility for threatening to harm someone in the past. [Update] One of the victims has been identified as Carlos Navarro Franco, 68.